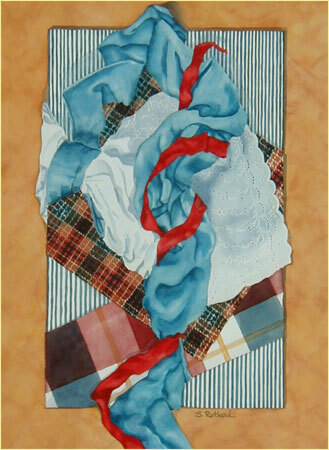 Shirley combines her love of working with textiles with the medium of watercolor. She draws upon her experience with the art of sewing and her passion for painting in this exciting new series: “It is delightful to mix and match color, texture, and pattern into an original design, put a light source on it, and then paint it!” If you are looking for an original piece that uniquely compliments your own home décor, Shirley invites you to provide her some of your own fabric samples, and commission her to create something beautiful for your home! All are originals using the finest quality materials. Framed pieces are archival with UV glass. All images displayed are for sale, unless labeled “private collection.” Contact the artist for pricing and commission information. Watch for limited edition Giclee prints, coming soon! Copyright © Shirley Rutland Watercolor Art, all rights reserved.